Supple-jack can tolerate extreme habitats and a wide range of conditions. 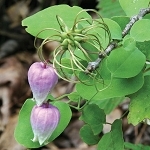 In bottomland forests, it can become a large, twining vine with woody stems. It can also grow in the desert-like conditions of Missouri glades where it becomes a densly sprawling mat. Wildlife use the plant both as a food source, eating the drupes of blue berries, and as a place of shelter. The berries should not be consumed by people. Its common names of supple-jack or rattan vine indicate its use for making walking sticks or wicker products. Q: How aggressive, invasive is this plant? A: It depends on how good your site is. The better the conditions, the more aggressive it will be. Supple-jack, like many vines, can spread by rhizomes underground. It doesn't seem to spread too far, but this trait could be used to describe the plant as aggressive. If you have a deer population, they will help to keep it in check. Supple-jack can grow on glades where conditions are pretty harsh--hot sun and dry, rocky soil. It will also be quite at home in the average backyard just about anywhere in Missouri. A single plant will be unable to produce fruits, so by planting only one, you will avoid seedlings popping up under bird perches.